Victorian Mosaic Tiling's mosaic tiles come in a variety of textures and finishes to compliment the style you are looking for. 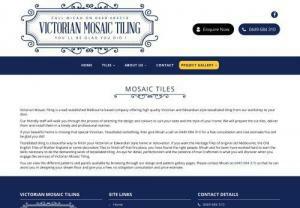 We are one of the leading suppliers of the premium quality of Victorian-Edwardian style tessellated tiles in Melbourne. We know which tessellated floor tile styles are best suited to your project. Some of the common areas of application for mosaic tiles are Interior, exterior, kitchen, bathroom, and swimming pool. We send you the price immediately.